I like observing the transition between epochs (or, in more architectural terms, ‘spans’ of time), photographers and their styles. 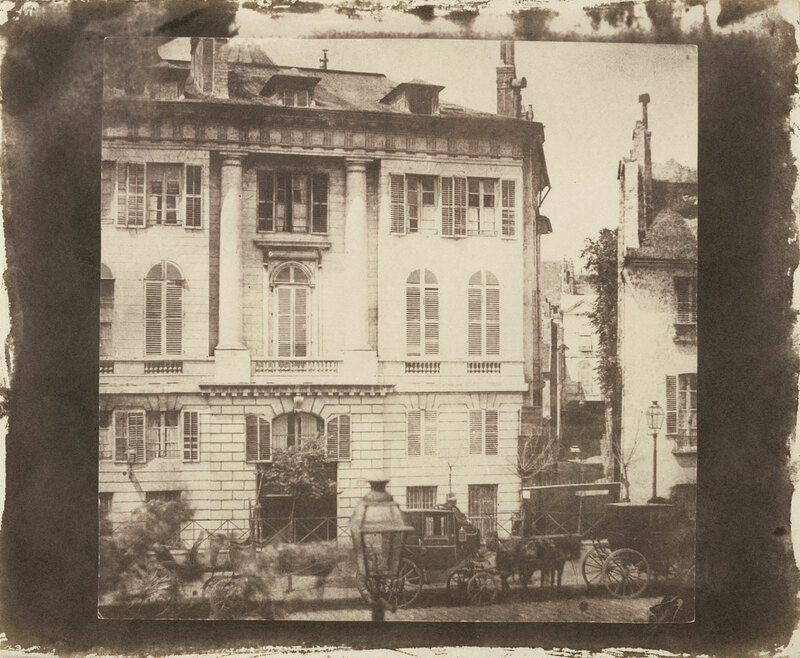 From the directness and frontality of Fox Talbot’s Boulevard des Italiens, Paris (1843, below) to the atmospheric ethereality of Atget’s angular The Panthéon (1924, below) taken just three years before he died; from the lambent light imbued in Frederick Evans’ architectural study of the attic at Kelmscott Manor (1896, below) to the blocked, colour, geometric facade of William Christenberry’s Red Building in Forest, Hale County, Alabama (1964, below). I love architecture, I love photography. Put the two together and I am in heaven. 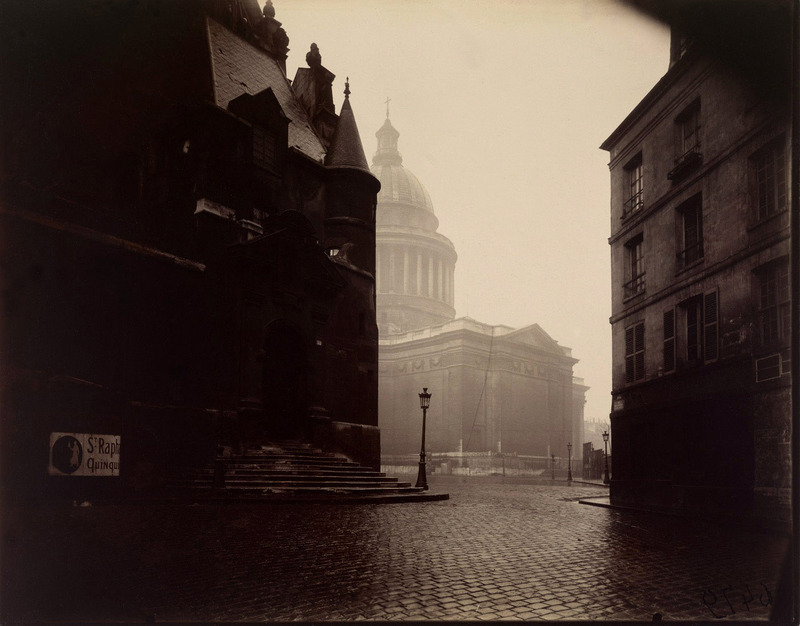 Eugène Atget made this atmospheric study across the place Sainte-Geneviève toward the back of the Panthéon, a church boldly designed to combine the splendor of Greece with the lightness of Gothic churches. The church’s powerful colonnaded dome, Atget’s primary point of interest, hovers in the background, truncated by the building in the left foreground. In order to make the fog-veiled Panthéon visible when printing this negative, Atget had to expose the paper for a long period of time. As a consequence of the long printing, the two buildings in the foreground are overexposed, appearing largely as black silhouettes. Together they frame the Panthéon, rendered entirely in muted grays. This photograph exceeds documentation to become more a study of mood and atmospheric conditions than of architecture. 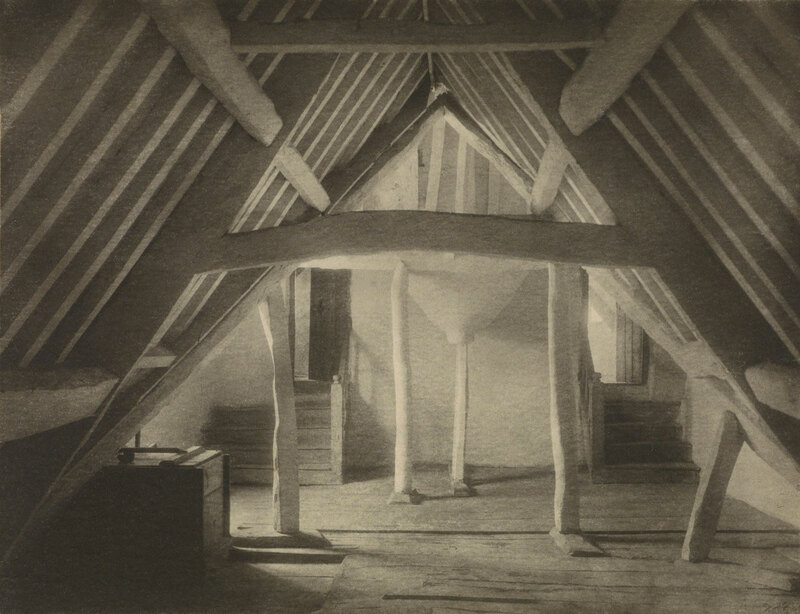 Frederick Evans’s architectural study of the attic at Kelmscott Manor, a medieval house, part of which dates from 1280, is a visual geometry lesson. The composition is all angles and intersections, formed not only by the actual structure but also by the graphic definition of light within the space. Soft illumination bathes the area near the stairs, while the photograph’s foreground plunges into murky darkness. The sharp angles of intersecting planes are mediated by the rough-hewn craftsmanship of the beams and posts, almost sensuous in their sinewy imperfection and plainly wrought by hand. The platinum print medium favored by Evans provides softened tonalities that further unify the triangles, squares, and diagonal lines of the dynamic composition. William Christenberry began photographing this makeshift wooden structure in his native Alabama in 1974. Since that time, he has made nearly annual trips to document the facade of this isolated dwelling, located deep in the Talladega National Forest. 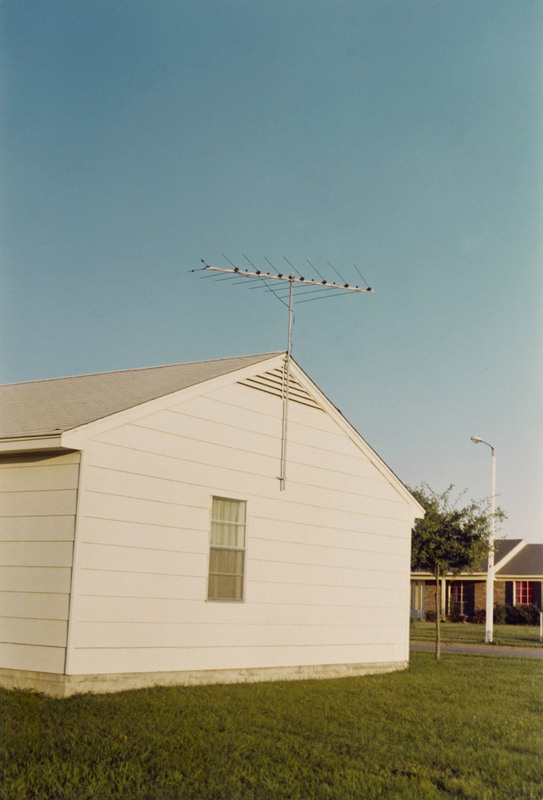 Such vernacular structures were uncommon photographic subjects until Walker Evans, Ed Ruscha, William Eggleston, and other twentieth-century photographers elevated their stature. Like the edifices photographed by Eugène Atget, Bernd and HIlla Becher, and others, the buildings Christenberry recorded in the southern United States were often in disrepair and in danger of disappearing altogether. Soon after its invention in 1839, photography surpassed drawing as the preferred artistic medium for recording and presenting architecture. Novel photographic techniques have kept pace with innovations in architecture, as both media continue to push artistic boundaries. In Focus: Architecture, on view October 15, 2013 – March 2, 2014 at the J. Paul Getty Museum, Getty Center, traces the long, interdependent relationship between architecture and photography through a selection of more than twenty works from the Museum’s permanent collection, including recently acquired photographs by Andreas Feininger, Ryuji Miyamoto, and Peter Wegner. Recognized for their accuracy and precision, photographs could render architectural details as never before and show the built environment during construction, after completion, or in ruin. Nineteenth-century photographers were eager to utilize the new medium to document historic sites and structures, as well as buildings that rose alongside them, or in their place. In 1859, Gustave Le Gray photographed the Mollien Pavilion, a structure that constituted part of the “New Louvre,” a museum expansion completed during the reign of Napoleon III. Le Gray’s picturesque composition highlighted the Pavilion’s ornamented façade and other intricate details that could inform the work of future architects. 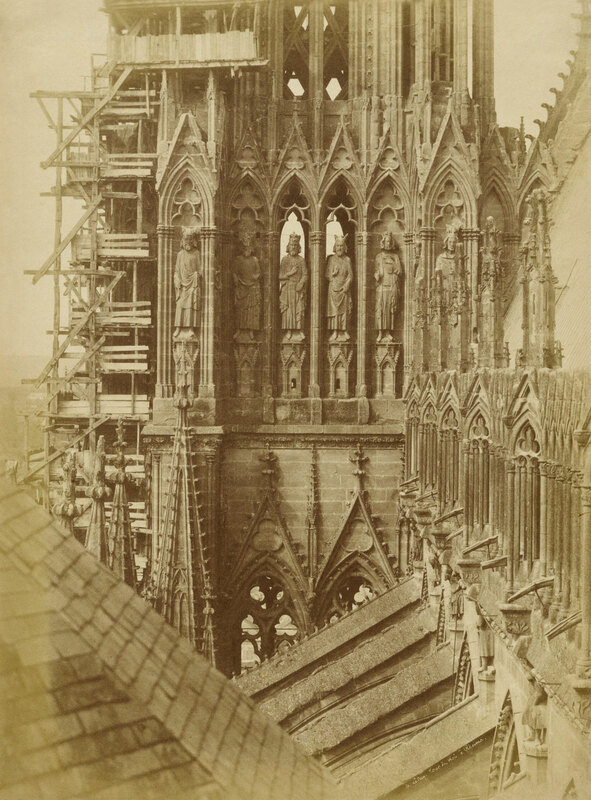 Louis-Auguste Bisson, a trained architect, worked with his brother Auguste-Rosalie to photograph grand architectural spaces such as Interior of Saint-Ouen Church in Rouen (1857). The Bisson brothers produced a monumental print, derived from a glass negative of the same size, to feature the nave of the structure in an interior view rarely depicted in 19th century photographs. A burgeoning commercial market for tourist photographs emerged toward the end of the nineteenth century. Views of architectural landmarks and foreign ruins became popular souvenirs and tokens of the ancient world. Artists such as J.B. Greene, who ventured to exotic destinations, provided visions of historic sites in Egypt, while Louis-Émile Durandelle took a series of photographs that documented the construction of the Eiffel Tower in the years before it became a symbol of the modern era at the World’s Exposition of 1889. Durandelle’s frontal view of the structure underscored its perfect geometric form, and his photographs were the earliest of what became a popular motif for amateur and professional photographers. Other noted photographers of this period included Eugène Atget, who obsessively documented the streets and buildings of Paris before its modernization, and Frederick H. Evans, who created poetic photographs of Romanesque and Gothic cathedrals. As the commercial market for photographs expanded and technologies advanced, representations of architectural forms began to evolve as well. In the twentieth century, images of buildings developed in conjunction with the rise of avant-garde, experimental, documentary, and conceptual modes of photographic expression. 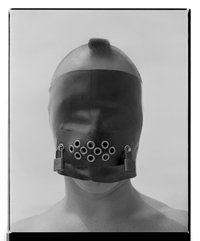 Andreas Feininger, who studied architecture in Weimar, followed what Bauhaus instructor László Moholy-Nagy called a “new vision” of photography as an autonomous artistic practice with its own laws of composition and lighting. 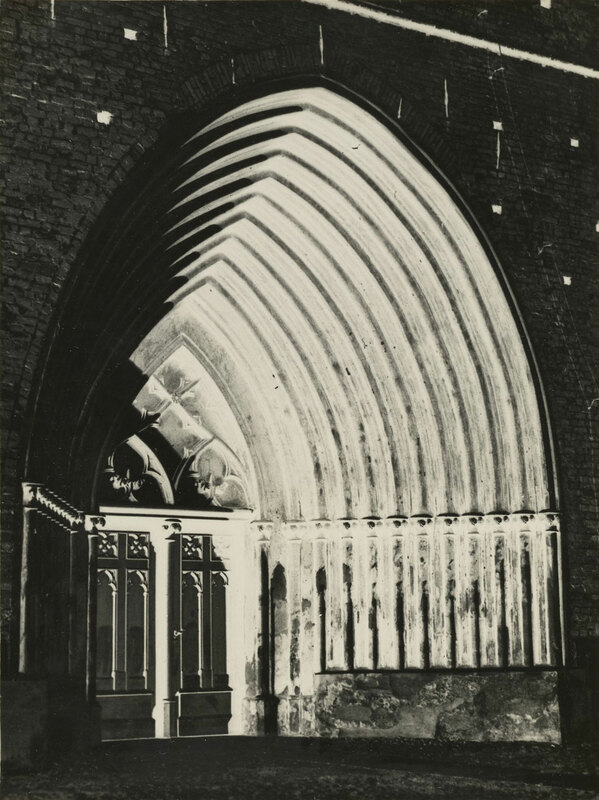 In Portal in Greifswald (1928), Feininger created a negative print, or a photograph with reversed tonalities, resulting in a high contrast image that enhanced the mystery of the architectural subject and removed it from its ecclesiastical context. At the same time the Bauhaus was influencing photographers throughout Europe, Walker Evans was at the forefront of vernacular photography in the United States, which elevated ordinary objects and events to photographic subjects. In keeping with this trend, architectural photography shifted its focus to ordinary domestic and functional buildings. 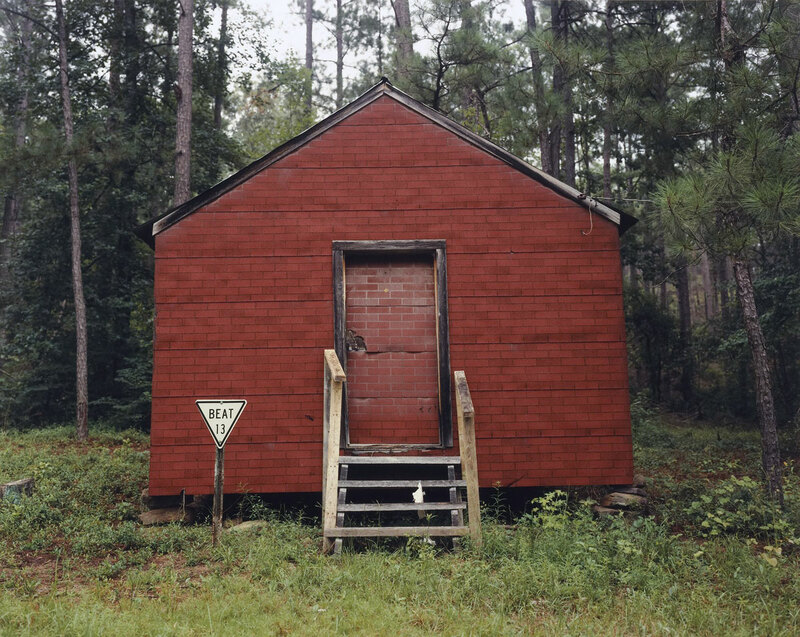 Derelict and isolated dwellings feature prominently in the work of William Christenberry, whose photograph and “building construction” of Red Building in Forest, Hale County, Alabama (1994) will be on display in the exhibition. Standing opposite a newly built pavilion of the Louvre, Gustave Le Gray made this photograph when the sun’s position allowed him to best capture the details of the heavily ornamented facade, from the fluted columns on the ground level to the figurative group on the nearest gable. Paving stones lead the viewer’s eye directly to the corner of the pavilion, where the sunlit facade is further highlighted beside an area blanketed in shadow. Though the extensive art collections of the Louvre had first been opened to the public in 1793, after the French Revolution, it was not until 1848 that the museum became the property of the state. Le Gray’s image shows the exuberance of the architecture undertaken shortly thereafter, during the reign of Napoléon III, when large sections of the building housed government offices. 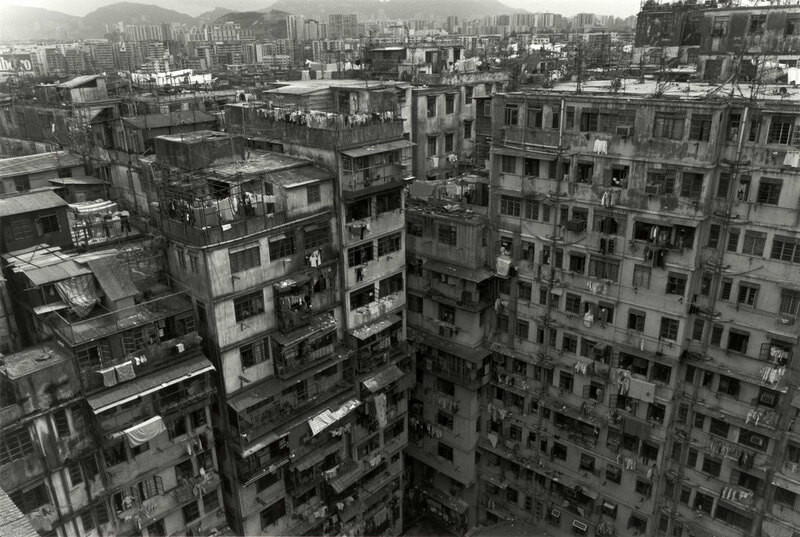 “The long, interdependent relationship between photography and architecture is the subject of this survey drawn from the Getty Museum’s collection. Spanning the history of the medium, the exhibition features twenty-four works by such diverse practitioners as William Henry Fox Talbot, Eugène Atget, Walker Evans, Bernd and Hilla Becher, and Ryuji Miyamoto. Seen together, the varied photographic representations of secular and sacred structures on display reveal how the medium has impacted our understanding and perception of architecture. In the nineteenth century, photography surpassed drawing as the preferred artistic medium for recording and presenting architecture. Recognized for their accuracy and precision, photographs could render architectural elements as never before. 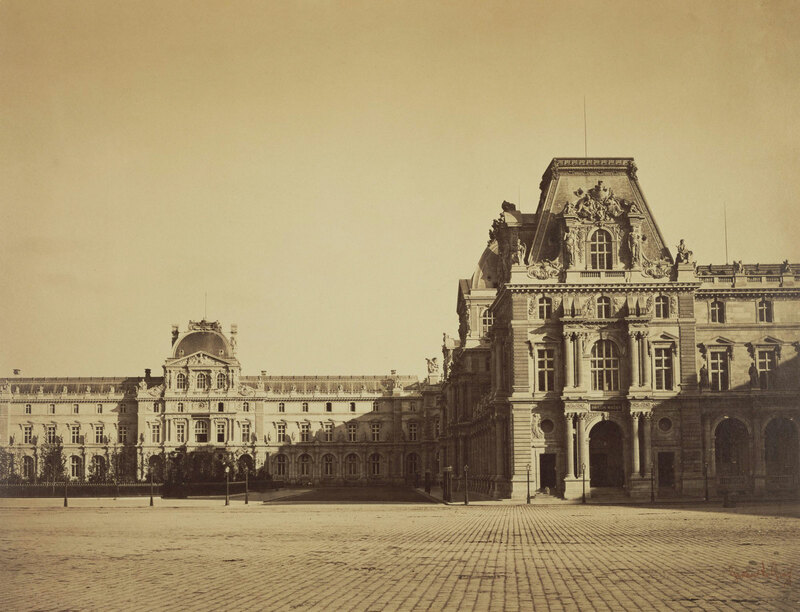 The intricate ornamented facade, the sprawling sunlit Napoléon Courtyard, and the classical design of the Louvre appear in magnificent detail in Gustave Le Gray’s picturesque image of the Mollien Pavilion, a structure completed in the 1850s during the reign of Napoléon III. Photographers working in the nineteenth century documented historic structures on the verge of disappearance as well as contemporary buildings erected before their eyes. They also captured the built environment during construction, after completion, and in ruin. 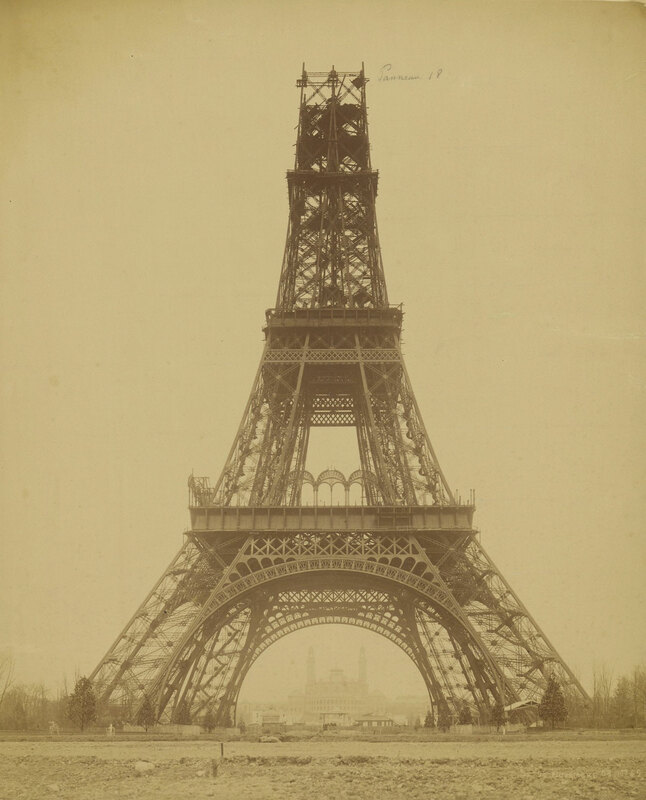 This photograph by Louis-Émile Durandelle shows the Eiffel Tower, the centerpiece of the 1889 World Exposition, in November 1888 when only its four columns, piers, and first two platforms were in place. With the advancement of photographic technologies and the modernization of the built environment around the turn of the twentieth century came innovative representations of architecture. Compositions and photographic processes began to reflect the avantgarde and modernist sensibilities of the time, and photographs of buildings, churches, homes, and other structures often showcased these developments. Andreas Feininger, who trained as an architect, utilized an experimental printing technique to depict gothic St. Nikolai cathedral in Greifswald in a nontraditional way. 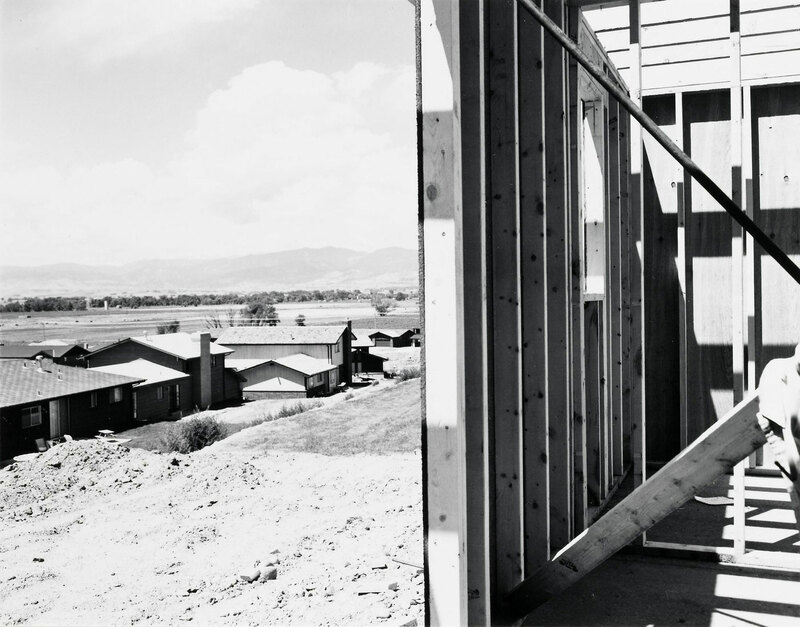 Images of architecture by contemporary photographers Robert Adams, William Christenberry, and others working in the documentary tradition often underscore the temporality of buildings. Vernacular structures found in his native Alabama are among the subjects Christenberry has systematically recorded for the past six decades. By returning year-after-year to photograph the same places, such as the red building shown above, Christenberry chronicles the decay (and sometimes the ultimate disappearance) of stores, tenant houses, churches, juke joints, and other rural buildings. The Centennial Exposition of 1889 was organized by the French government to commemorate the French Revolution. Bridge engineer Gustave Eiffel’s 984-foot (300-meter) tower of open-lattice wrought iron was selected in a competition to erect a memorial at the exposition. Twice as high as the dome of St. Peter’s in Rome or the Great Pyramid of Giza, nothing like it had ever been built before. This view was made about four months short of the tower’s completion. Louis-Émile Durandelle photographed the tower from a low vantage point to emphasize its monumentality. The massive building barely visible in the far distance is dwarfed under the tower’s arches. Incidentally, the tower’s innovative glass-cage elevators, engineered to ascend on a curve, were designed by the Otis Elevator Company of New York, the same company that designed the Getty Center’s diagonally ascending tram.